can replicate approximately every 20 minutes by binary fission, which is a simple form of cell division. This level of replication will depend on the availability of nutrients and other suitable conditions such as temperature. 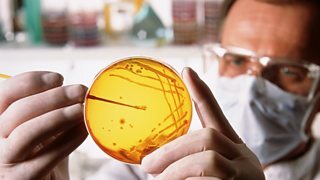 are created by pouring hot molten agar into sterile Petri dishes, which are then allowed to set. Bacteria can be streaked onto the plates using a loop, and allowed to form individual colonies of the specific bacterium. 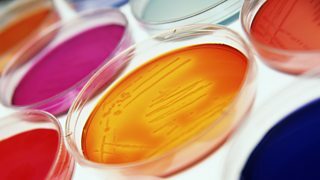 Alternatively, bacteria can be spread all over the agar plate to form a lawn of bacterial growth, rather than individual colonies. Nutrient broth solutions, culture vials, agar solution and Petri dishes are all sterilised to stop any other microorganisms growing on or in them. This is often done in an autoclave. These are strong containers, a little like ovens, which use high temperatures and pressures to kill microorganisms. Personal possessions are swabbed for bacteria which are then cultured on agar plates.
) 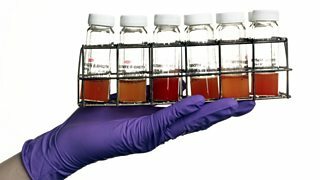 and would complicate the results of experiments when testing the efficiency of antibiotics or other anti-microbial compounds. This avoids contaminating cultures that should already be sterile. The growth medium (broth solutions and agar) will be sterile after autoclaving. The containers (Petri dishes and culture vials) will also be sterile after autoclaving.